As a founding board member of 500 Men Making a Difference George Hutchinson has been focusing much of his time outside of work for the last 5 years on supporting young men and boys of color in our community. Utilizing his personal experience, professional skills as a licensed electrician with Con Edison and an intense desire to mentor young men of color he has developed the Race 4 Excellence program. Race 4 Excellence is a comprehensive mentorship and tutoring program that focusing on building remote controlled cars and creating racing competitions for the participants when the building project is complete. Volunteer mentors working with George spend 4 hours each month with eligible students showing them the basic materials needed to build the remote control car, teaching them how to assemble the components, how the motors work, how the cars are wired and finally how to paint the pre-fabricated bodies for their cars. Students participate in group discussions about character, conflict resolution, the importance of their educational achievement, math and science skills during the program. 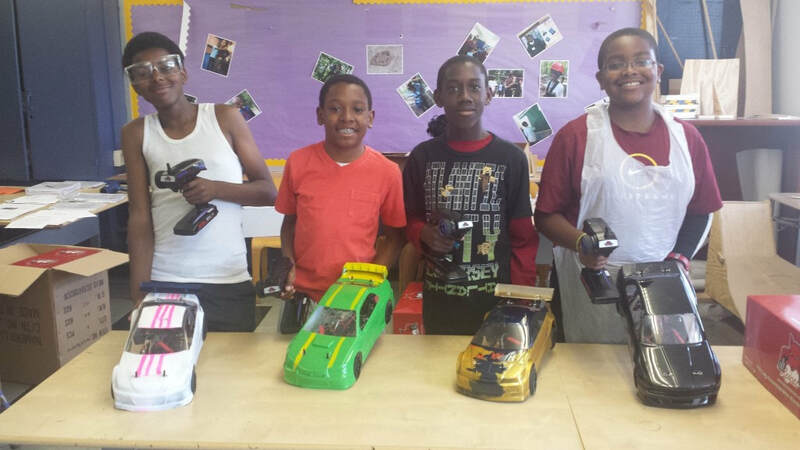 Race 4 Excellence was piloted at Launch Expeditionary Charter School in Brooklyn New York in 2014. Race 4 Excellence is a S.T.E.M. focused mentorship program made possible with the partnership of Launch Expeditionary Charter School and Brooklyn Hobbies. Thanks to Brooklyn Hobbies for partnering with 500 Men and making it possible to impact the lives of these students at Launch Expeditionary Charter Middle School.